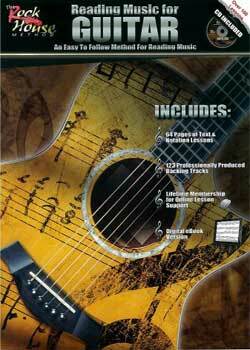 Reading Music for Guitar The Rock House Method PDF + Mp3 CD download. Here is a modern, unique learning system that starts from the beginner level and progresses through advanced techniques. This comprehensive method covers melody, rhythm, chords, scales and even lead guitar techniques. Learn theory, dynamics, syncopation, the major scale formula and how to apply it all to the guitar. Learn the basics of blues, rock and many songs and progressions. Over 120 professionally recorded audio backing tracks and playing examples on the included MP3 CD will guide you through each lesson. Use the in-depth quiz system to gauge your progress at each step and help ensure an effective learning experience. Download Reading Music for Guitar – The Rock House Method PDF free and other books from our site. Only high quality PDF scans. Please write a review, it's important for our community.